Preheat oven to 350. 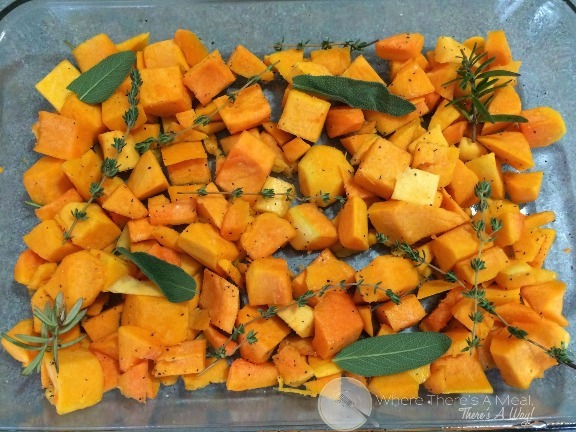 In a large greased baking dish place your cubed butternut squash, a handful of your fresh herbs, salt and pepper. 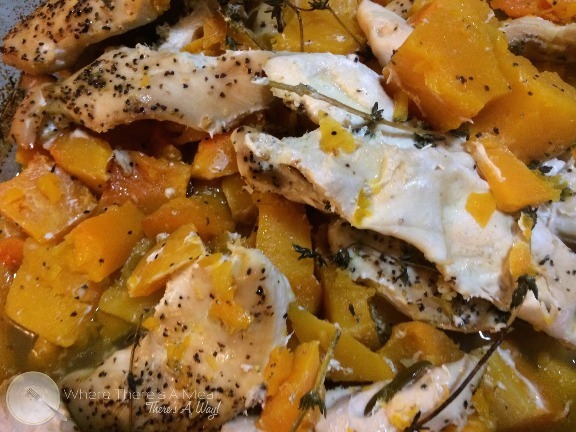 Place chicken on top of butternut squash. Top with more fresh herbs, lemon zest, lemon juice, grated garlic, white wine, salt and pepper. Cover with foil and bake at 350 for 45-55 minutes. then again sometimes the dinner smells so amazing you eat it ALL before you take a decent picture. So yeah.....I have to say sorry about this photo, it just doesn't do this meal justice. But then again shouldn't that say something? Basically the meal smelled so amazing I just couldn't wait to dig in. After everything was eaten, I looked at the empty pan, and thought, "Well...I think I took a picture?" The butternut squash is heavenly; busting with herb flavor all while still maintaining that delightfully sweet butternut squash quality. The chicken is moist and flavorful, the perfect companion to the squash. Best of all? This meal is REALLY, REALLY easy to make! I bought pre-cut butternut squash, so basically this took me about 5 minutes to assemble. Looking for an easy meal to prepare, that will smell so delicious even a food blogger will forget to take a decent picture of it before diving in?! Where there's a meal, there's a way! Tried this recipie tonight and it was fabulous! Chicken was very moist. Great depth of flavor with the herbs! Served it with a vinagarrete salad topped with Gorgonzola! Thanks Keliegh! Definately incorporating this into our routine!!! Yea! Thank you so much Tanya! 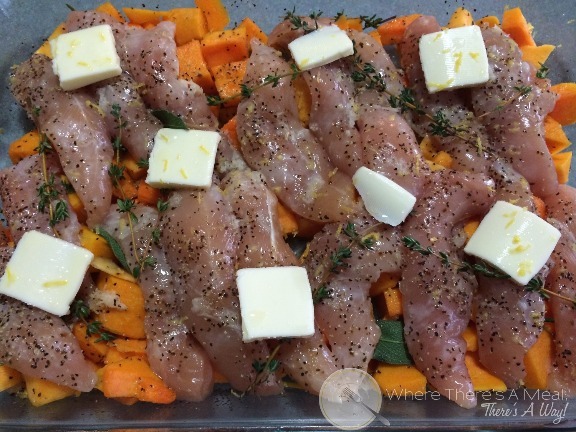 That salad sounds like the perfect paring with the chicken and butternut squash, I will have to try that next time!